For the past few years, it has been my custom to create what I call a “web presence.” I would write a post on my website, use http://bit.ly to create a short URL back to that post, use http://twitter.com/xplorenewmedia to notify followers of that post, use the same text with perhaps a few extra descriptive words and post to http://facebook.com/exploringnewmedia. My “web presence” has not been very productive in terms of getting people to comment on my blog post. I am using a service called Feejit to tell me about each visitor to http://exploringnewmedia.com. You can see how it works if you visit the site and check out the sidebar for “Who’s Looking at Me Now?” The last 10 visitors’ locations are shown. None of those visitors commented. About a month ago, I became more interested in Google+ as yet another social media platform and I’ve been very excited with it. I’ve been using Facebook primarily to see pictures and comments posted by the parents of my 3-year old grandson. I’m not sure why I’ve continued to tweet. But with Google+, I’ve selectively added people that I want to follow based on their posts and how interesting they appear on their profile pages. I won’t try to compare Google+ with Facebook or Twitter and I won’t forsake them. 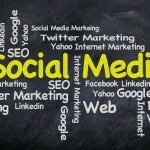 I will add Google+ to my social media toolbox as an addition to my web presence. I’m taking a course on Google+ from PlusYourBusiness. I’m midway through it and will wait until I’m finished before describing what I’ve learned. Do you have a web presence? How do you use social media? What more would you like to know about Google+ that you can’t or don’t want to Google to find out? Think about that last sentence.